For assistance in planning a meal following a funeral. Ladies Bible Study Group meets on Tuesdays beginning at 2:00 p.m. in the church conference room. If interested, contact the parish office at 483-2871. A Men’s Faith Group meets on the 1st and 3rd Sundays at 7:00 p.m. for 60-90 minutes. We will meet to support, affirm, and share insights about the difficulties men encounter in both their home and work lives. We will also seek God’s help in dealing with the issues we encounter every day. In addition, we will be reading and discussing the Readings for the upcoming Sunday. Group meets in the Education Center classroom on Tuesday evenings beginning at 7:00 p.m. for approximately an hour. 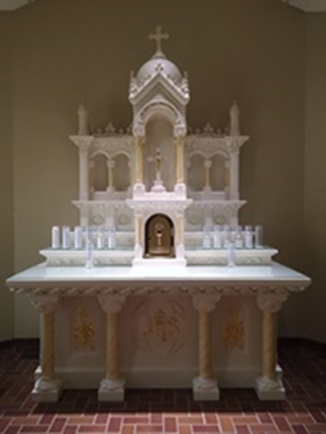 1st Friday 8:00 a.m.—6:00 p.m.
Any parish organization may use the Parish Hall free of charge. However, you must check with the parish secretary (483-2871) to reserve the Parish Hall for a particular date; this assures that you get the hall when you need it and avoids having more than one group being in the same place at the same time. We remind you that no food shall be taken in the carpeted areas without special permission. We also request that you leave the room clean for the next group using it by following the Parish Hall Cleaning Checklist that will be provided for you when you reserve the hall. Also, please turn off all lights when you leave. Older (heavy) tables and chairs may be checked out for use by contacting the Parish Office.